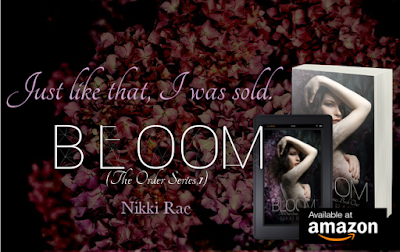 Bloom is the first book in The Order series by Nikki Rae. 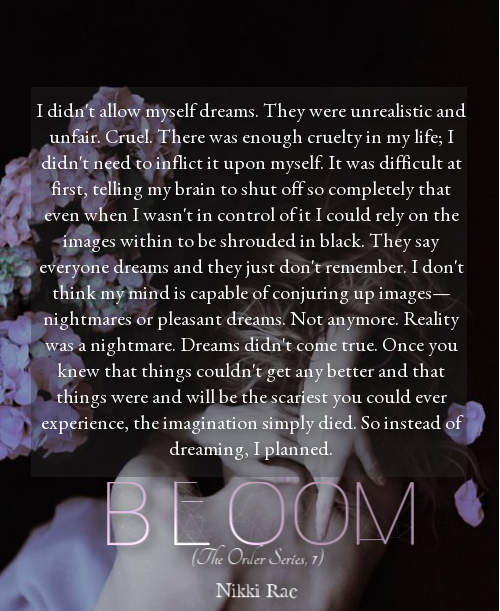 You can always count on something out of the box with this author, and that's one of the things I love about her stories. Fawn's world is pretty much a nightmare, literally. She isn't free. I'm not sure yet how the "outside world" is within this story, but I get the impression it's pretty much like our world. Then you have people like Fawn who are sold or stolen into the Order, much like, if not just like human trafficking. The rich and elite within the Order buy these children and young adults and do pretty much whatever they want to with them. Fawn's new owner seems different in many ways. He lost my loyalty pretty early on, but as I learned more about him, I found out the reasons behind his actions. I still don't excuse him. Fawn fights her feelings. She knows better, and the girl has some inner strength, let me tell you! She has to. It's how you survive in her world. These characters are complex, complicated, and feel so alive... it's easy to forget you're reading a book. 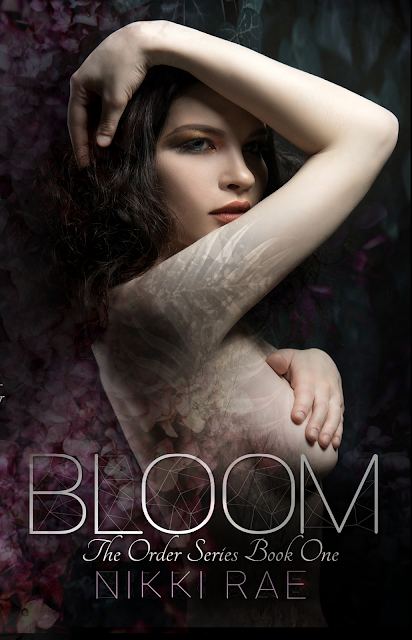 The ARC of Bloom by Nikki Rae was kindly provided to me by the author for review. The opinions are my own. “Fawn,” he said suddenly, his voice soft but still making me jump in my seat. “Were they out of flower names?” he asked, a smile in his voice. He let on that he knew about the inner-workings of the actual Compound more than my last Owner. Then again, my last one only cared about one thing. He didn't play these mind games this guy seemed to like. Master Lyon sighed, convinced I wouldn't answer, but for some reason I couldn't keep my mouth shut. “I was one of the originals at the California Compound.” I hesitated almost too long before I brought my eyes back to his face. He was staring, waiting for me to say more. 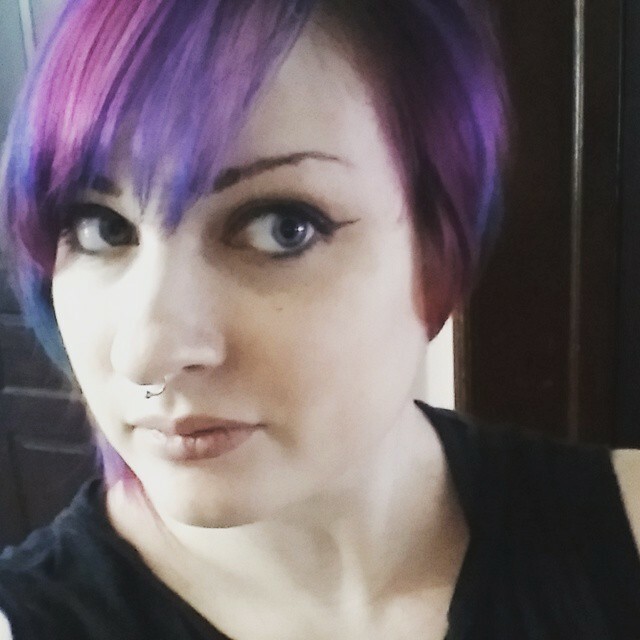 “We all had animal names,” I said, trying and failing to hide the disgust in my voice. I blinked, wondering what he meant. So this would be my new name? Not Dog or Whore, but Doe? I didn't know why he cared if I did or did not like something. It shouldn't matter to him. I didn't like any of this and it was obvious. He was asking to toy with me, get me to talk. I was done talking. I bit the inside of my cheek to keep the words from spilling out. 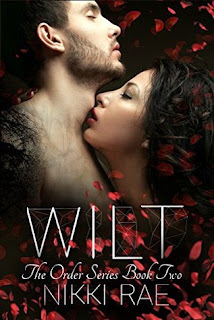 Check out my review of the next book in this series! 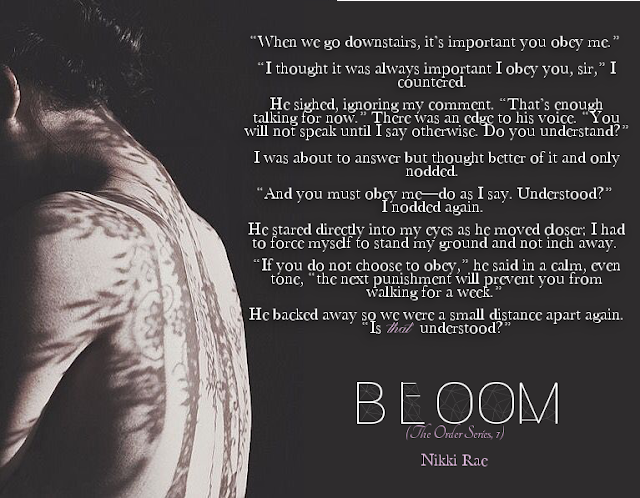 To learn more about Nikki Rae and her books, visit her website & blog.You can also find her on Goodreads, Facebook, Tumblr, and Twitter.